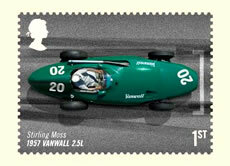 Racy new stamps feature six classic Grand Prix racing cars that were driven by champion British drivers (on British tracks) including Srirling Moss’s Vanwall car, built in Acton. The Grand Prix 2007 were issued by Royal Mail on Tuesday 3 July. 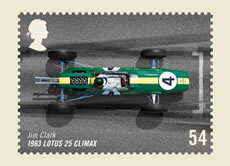 These stamps mark two special motor sport anniversaries – the centenary of Britain’s first motor racing track at Brooklands, Surrey and the 50th anniversary of the British driver Stirling Moss winning the British Grand Prix in a British car – the 1957 Vanwall 2.5L car. A stamp presentation pack featuring all six stamps contains an exclusive interview with Grand Prix legend Sir Stirling Moss. Many people consider Moss to be Britain’s greatest ever Grand Prix driver. The highly successful Vanwall car was built by Vandervell Products Ltd, Western Avenue, Acton. Owner Tony Vandervell wanted to see British racing cars beating the Italians. The Vanwall name was a combination of Vandervell (company owner’s name) and Thinwall (company made Thinwall bearings for racing cars. The first Vanwall car competed in 1954, with no victories. Car refinements improved performance and in 1956 Stirling Moss did a comparison test between the Vanwall, Connaught and BRM and decided to drive for Vanwall in 1957. Tony Brooks was signed up to drive the second Vanwall car. In 1957 Moss became the first British driver to win the British Grand Prix in a British car. By 1958 Vanwall won the first ever Constructors Championship as the car won six of the nine rounds of the World Championship – Moss and Brook won three races each. Sadly at the end of 1958 the company announced that the racing team would no longer compete because of the ill health of its founder Tony Vandervell. The company then declined and the Vanwall name disappeared from motor racing until recently. The company name was bought by an American organisation. Vanwall Cars is now based in Peterborough and it manufactures, designs and develops high performance sports racing cars for use on the road or the track. 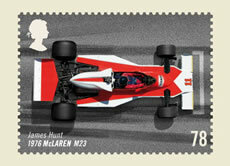 Melanie Corfield, Royal Mail’s Head of External Relations for London & the South East said: “These stamps capture the thrill and excitement of motor racing. They will allow everyone to celebrate two special motor racing anniversaries - Stirling Moss is a sporting legend and Brooklands helped to pioneer motor racing in Britain. Most of the cars featured come from the Donnington Grand Prix Collection museum and all were shot on the famous Donnington race track. As the cars are too precious and fragile to sit in photos of drivers had to be “photo-hopped” into the car images. Stamp issues, like this one, are normally planned two years in advance. Royal Mail is producing a Presentation Pack with exclusive interview with champion British driver Sir Stirling Moss together with profiles of the other five champions and their world beating cars. A first day cover with insert profiles four of the Classic Grand Prix Circuits. There is also a set of six stamp postcards and a medal cover featuring Sir Stirling Moss to accompany the Grand Prix 2007 stamp issue. No less than 10 Britons have won the British Grand Prix – Stirling Moss, Peter Collins, Jim Clark, Jackie Stewart, James Hunt, John Watson, Nigel Mansell, Damon Hill, Johnny Herbert and David Coulthard – but not Graham Hill. Grand Prix racing started in Britain by Henry Seagrave in 1926 at the Brooklands Circuit, Surrey. Until 1987 the British Grand Prix alternated between Silverstone and the home of racing, Aintree (1955-1962) and Brands Hatch (1964-1986). Silverstone Circuit was originally an airstrip and a major wartime bomber training centre during WW2. Jack Brabham won in 1996 the title as the only driver with a car that had the same name as the driver. The Grand Prix of Great Britain in 1973 was the first F1 Grand Prix to be restarted when the race had to be stopped after the first lap because of a serious accident. Stirling Moss’s 1957 British Grand Prix victory at Aintree came when team-mate Tony Brooks handed over his car after Moss’s car broke down. It goes down in the record books as the event’s only “joint” winners. Lewis Hamilton is the most successful ever rookie Grand Prix driver – he has finished in podium position (first, second or third) in his first seven races. He came third in his first race, followed by four second positions and then successive victories in the Canadian and the American Grands Prix.